If you love winter sports or you are looking for the perfect place to spend the Christmas and New Year holidays, you are probably heading to our most popular winter resort – Bansko. You have chosen the hotel for your Christmas holiday in Bansko 2017, you have prepared the ski equipment and you can hardly wait to indulge in the entertainment that awaits you at the resort. And they, the entertainment and attractions in Bansko just now are so many and you will not be bored for a moment during your stay. You have panned it all but do you know where you can eat delicious food while you are resting or skiing in Bansko? To make it easier for you, we will take a short walk around the town’s restaurants and trust us that they are not at all a few. So, let us introduce you to some of the popular restaurants in Bansko and what kind of cuisine you can try there. It is impossible not to start with the taverns in the resort, as the region boasts of its great traditional Bansko cuisine, which everyone who has come on a holiday or to ski ties at least once. The taverns in Bansko will offer you national and regional dishes that have been prepared for centuries in this region. Each tavern has its own authentic recipes and each evening you can visit a different restaurant and the dishes that will bring you will have a different flavor and aroma. Typical of this type of entertainment is live music, the folk-style of furnishing and the open fireplaces that warm up both the soul and the body. The taverns are the perfect solution for family and friendly gatherings, celebrating different events or just for a warm, romantic dinner with loved ones in an intimate setting. In Bansko the taverns are the most numerous and each of you can find the place you like most, but still… here are some of the restaurants that are very popular among the guests of the town. This tavern is among the oldest taverns in Bansko and if you have the time and the desire to try the traditional Bansko cuisine in an authentic atmosphere and in the company of friends, you will be pleased with your visit. Here you will find a wide variety of game dishes, traditional Bansko dishes and a large wine collection. The setting is pleasant, the menu is well-chosen, and the mood will be taken care of by an orchestra that performs live folk and popular music. 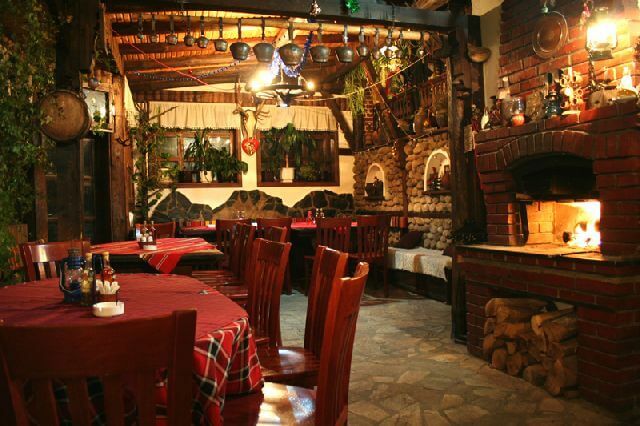 The restaurant is designed in a traditional Bulgarian style, a very cozy and pleasant place, especially if you were going down all day on the white ski slopes of Bansko. Once again traditional Bulgarian dishes, specialties from Bansko cuisine and a large assortment of alcoholic beverages await you at the Vodenitsata Tavern. Here you will be welcomed with Macedonian music, cozy atmosphere and will be served delicious fire roasted dishes. The menu of Kasapinova tavern is very precise and the service is impeccable. The restaurant is one of the most preferred ones by the guests of the town because the atmosphere, the service and the food are excellent. We will not surprise you if we told you that at Baryakova tavern you can enjoy dishes from the local Bansko cuisine and a rich wine collection. We assume that while you are skiing in Bansko you will want to try something other than traditional cuisine, right? That is why we are going to the next type of restaurants where you can taste delicious Italian cuisine in a refined setting. Yes, Mediterranean cuisine is one of the most popular cuisines in the world. It is therefore perfectly logical for Bansko to have restaurants offering Italian cuisine. If you are among the fans of this cuisine, be sure to visit one of the most popular and refined restaurants that offer Mediterranean cuisine in the town. If you think you’ve had pizza and spaghetti many times and that you cannot be surprised, you’re wrong. Italian cuisine is not just pizza and spaghetti, but much more than that. 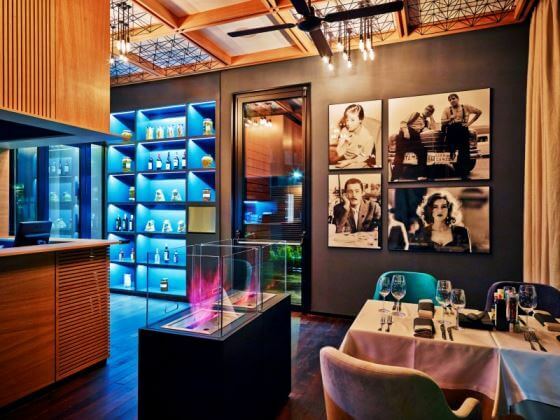 So if you want to taste genuine Italian cuisine in a stylish and refined setting – the restaurant is only one – Leonardo Bansko. At Leonardo, all dishes are prepared with fresh produce coming directly from different regions of Italy, and the recipes are entirely original. The environment that will welcome you in Leonardo is stylish, exquisite and completely in the spirit of Italy. The menu is precisely selected and varied, and the dishes you can try here you will certainly not try anywhere else, not only in Bansko but also in Bulgaria. Oh, and if you’d like to be present at one of the biggest attractions in Bansko while eating – to see how the chefs prepare the dishes that you will be served, you can watch them in the show cooking section of the restaurant. Leonardo Bansko Restaurant is one of the most preferred places among tourists who have chosen a Christmas holiday in Bansko 2017. Refined Mediterranean cuisine can also be enjoyed at the Come Prima restaurant. The setting here is sophisticated and the menu features both popular Italian cuisine and a rich collection of wines from around the world. Do you fancy eating at a place where the menu is varied and international? Bansko has something to surprise you again. One of the best restaurants with such a menu is Le Bistro. The restaurant offers a cozy atmosphere and a menu that will surely appeal to you. Elegance, class and dishes from the most popular cuisines await you at Le Bistro. Here you can taste both traditional Bulgarian dishes as well as dishes from the Italian, French and Spanish cuisine. And for those of you who are vegans, there is a special menu that will satisfy all their expectations. The restaurant will offer you a varied menu of dishes from the Bulgarian, Greek and Mediterranean cuisine. The atmosphere is very original and intimate, the service is up to the standards, and if you love wine – here you can taste the rich wine collection from all over Europe. Let’s admit, sushi bars in recent years have become very popular and loved in Bulgaria, too. But if you have not been able to try sushi yet, it is a good time to do so while skiing in Bansko. This is the most popular sushi restaurant that will take you directly to Asia. Only here, right in front of you, chefs will prepare your sushi with original Japanese recipes. The Sushi Bar and Teppanyaki Grill has a sophisticated and stylish setting, the menu is varied and the opportunity to enjoy the master skills of Japanese chefs who prepare food in front of you is a unique experience. An international resort would not be that if there were not a few pubs at it, right? If after a long day on the ski tracks you want to try live beer, then we advise you to visit one of the most popular pubs in Bansko – Bar dinner and beer Boulevard. Besides the live beer, here you will find tasty local grill dishes, popular desserts and of course good service and a stylish setting. Another popular pub is the Queen’s Pub, where the atmosphere will appeal to you, and your fatigue will disappear as you taste delicious French fries, chicken wings and, of course, beer that is available in a wide variety of world and brand names. Have they wondered what makes Switzerland so popular as a destination especially in winter? What is the thing that all skiers who go down the slopes of the Swiss or French Alps dream of enjoying at the end of the day? Fondue of course! Well, if you want to gather around the table with friends to eat a delicious fondue while you are on a Christmas holiday in Bansko 2017, then Fondue restaurant Bansko is just for you. 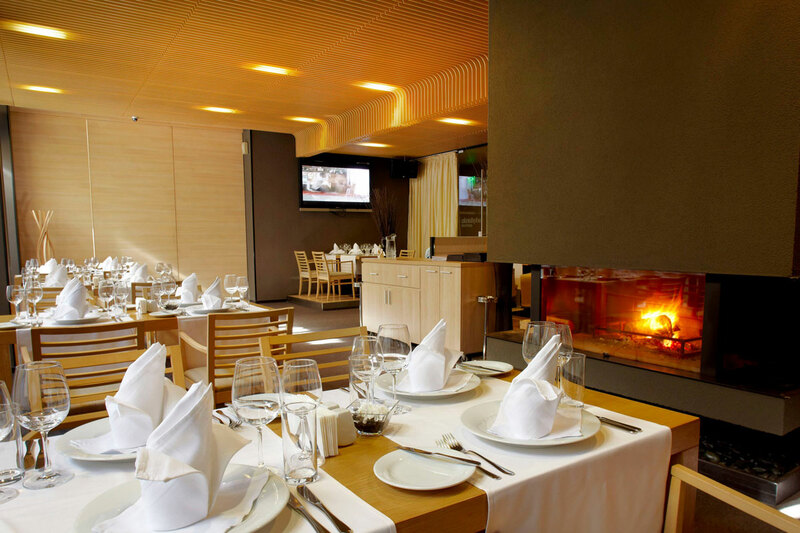 Fondue Restaurant is the only restaurant in Bansko that offers Alpine cuisine. The restaurant will impress you not only with a cozy, sophisticated atmosphere and perfect service, but also with carefully selected dishes from the French and Swiss cuisine. You did not expect while you are skiing in Bansko to find exactly there, at the foot of Pirin mountains, an Armenian restaurant, right? The restaurant is the only one in the city that offers Armenian cuisine. 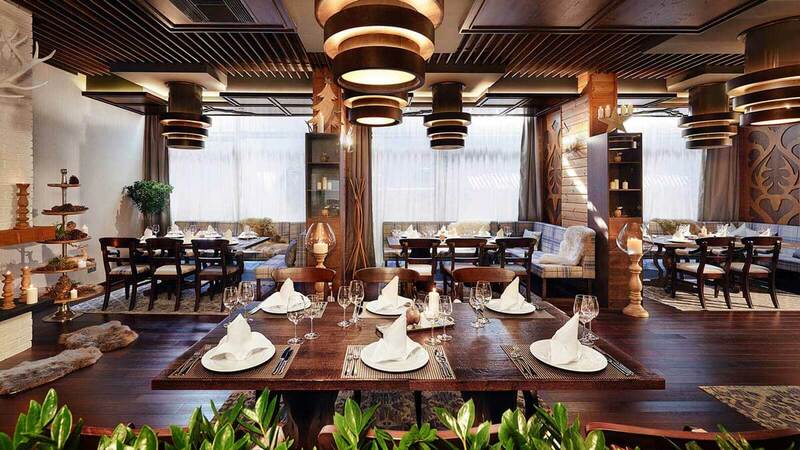 The setting is very stylish and the menu is oriented towards the presentation of typical and popular traditional dishes of Armenian cuisine. The holiday will really be a holiday if at least once during your Christmas holiday in Bansko 2017 you went to one of the nightclubs of the town. And there really are plenty of them and you can choose whether to go to a nightclub, a discotheque or a karaoke bar. *Oxygen Bansko – for house, dance hall and drum and bass music. Oxygen regularly invites popular guest DJs, so if you enjoy this style of music, the club will really appeal to you. *Jack’s House – popular hip hop, pop and R & B music. The setting is very enjoyable, the service is up to the standards and the mood degrees are always high.